All the Broken Places was a rather interesting read, and unlike my normal fare. I liked it. Reader advisory: our main character, Cate, is dealing with the suicide death of her mom, and has suicidal ideation tendencies. If this is a trigger for you, I don’t recommend reading this title. 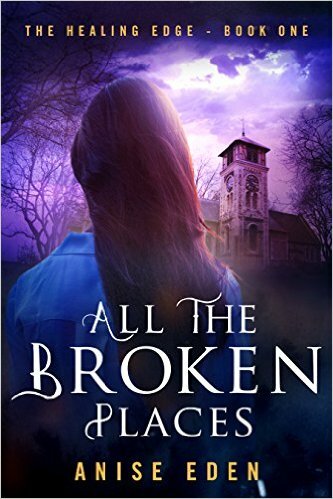 Even though All the Broken Places deals with some tough content, I felt it was handled honestly and with incredible sensitivity. Cate, practically agoraphobic since her mom’s death ten weeks prior, is struggling to regain ‘normal’. She has a slim support system in a work colleague and her friend-with-benefits. Cate, however, is a social worker. In addition to the strong empathy a ‘normal’ social worker has, Cate is able to sense her clients with some different empathic ability. This ability is causing her additional issues as she recovers from her mom’s death, and continues to check on her clients through their bond. Her boss recommends she see someone to help her process her mother’s death, and she is sent to Dr. MacGregor. In the good doctor’s office, she is eventually able to open up about the ‘weird’ things about her. Fortunately, the doctor and her hottie son are experts in weird. They want Cate to agree to attend an intensive program for three weeks. Cate is cautious, but says she is willing to listen. As the nature of this pretty cool program is revealed to Cate, she becomes skeptical, and wants to leave the program. There’s a couple reasons she doesn’t, in my opinion. One of which is Ben MacGregor, who she is attracted to, but struggles to reconcile the emotions swirling around about him. Ben is also a bit broken, and I think all the participants in the MacGregor Group are, to some extent. I like Ben, and I am really interested to learn more about him in the next title. We got some great formative information about him in this title–just enough to whet my appetite. I was particularly interested in the world building done by the author. Ancient civilizations, alternative belief systems, and some quirky personalities make for some fascinating interactions and created all the questions for the next title. All of Cate’s problems are in her head. That may be her greatest strength. Cate Duncan is a promising young therapist, dedicated to her work. But after her mother’s suicide, she is seized by a paralyzing depression. To save her job, Cate agrees to enter a program with Dr. Angeline MacGregor, run by her stern son, Ben, and housed in a repurposed church. Cate doesn’t quite understand what the program entails, but she soon learns that the skills she will develop there may not only help her learn how to cope with her own problems, but will also lead her to a much greater purpose. The MacGregor Group is a collection of alternative healers whose unconventional approaches include crystals, aura reading and psychics. They know that their life’s work invites skepticism, and welcome the chance to prove naysayers wrong. But they need the unique abilities that Cate can bring, and as she slides ever closer to her own abyss, they will do everything in their power to protect Cate from those who wish her harm—including herself.